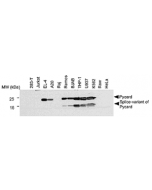 Mouse NLRP3 is detected in mouse macrophages using the monoclonal antibody to NLRP3 (Cryo-2) (Prod. No. AG-20B-0014). 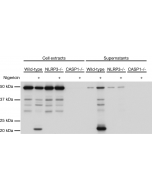 Method: Cell extracts from mouse macrophages (BMDMs) WT +/+ (lane 1), NLRP3+/- (lane 2) or NLRP3 -/- (lane 3), with or without treatment with LPS (50ng/ml) for 3h, were separated by SDS-PAGE under reducing conditions, transferred to nitrocellulose and incubated with the mAb to NLRP3 (Cryo-2) (1µg/ml). Proteins are visualized by a chemiluminescence detection system. Picture courtesy of Dr. Olaf Gross, Munich University, Germany. 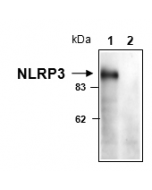 Recombinant mouse NLRP3/NALP3 (pyrin domain/aa 1-93). The inflammasome is a multiprotein complex that mediates the activation of caspase-1, which promotes, amongst others, the secretion of the proinflammatory cytokines interleukin (IL)-1β and IL-18. Members of the Nod-like receptor family, including NLRP3/NALP3, are critical components of the inflammasome that link danger-signals to caspase-1 activation. Defects in NLRP3 are the cause of familial cold autoinflammatory syndrome type 1 (FCAS1), Muckle-Wells syndrome (MWS) and of chronic infantile neurologic cutaneous and articular syndrome (CINCA).